A couple rehab and refine a drab suburban home outside of New York City. 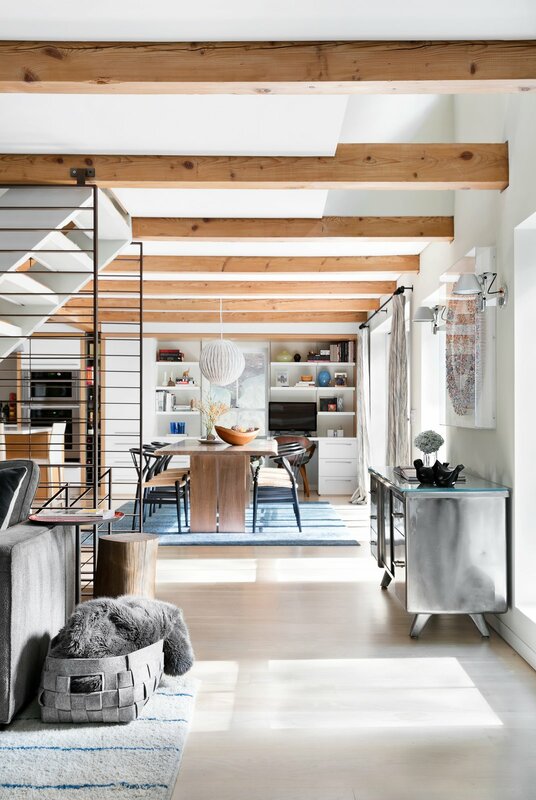 When Andrew and Emily Kotchen began searching for a house in Irvington, New York, a village about 20 miles north of Manhattan, they wanted a home with the bright, airy feel of a SoHo loft. But the house they eventually bought was exactly the opposite: a 1974 Vermont Frames kit house with heart-pine wall paneling and ceilings, few windows, and the look of a dark cottage. Once covered in dark pine, a New York home is now radiant in Paper White by Benjamin Moore. 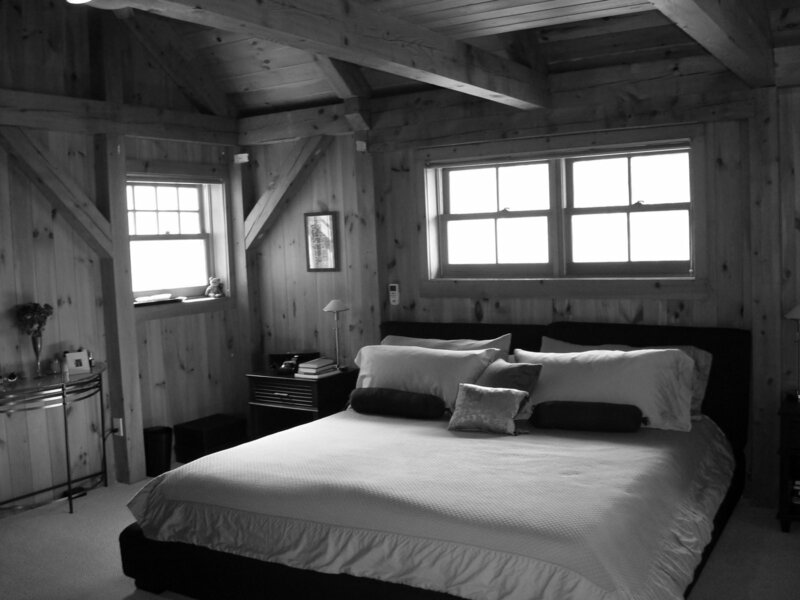 The bed, flanked by George Nelson sconces, is from Crate and Barrel. 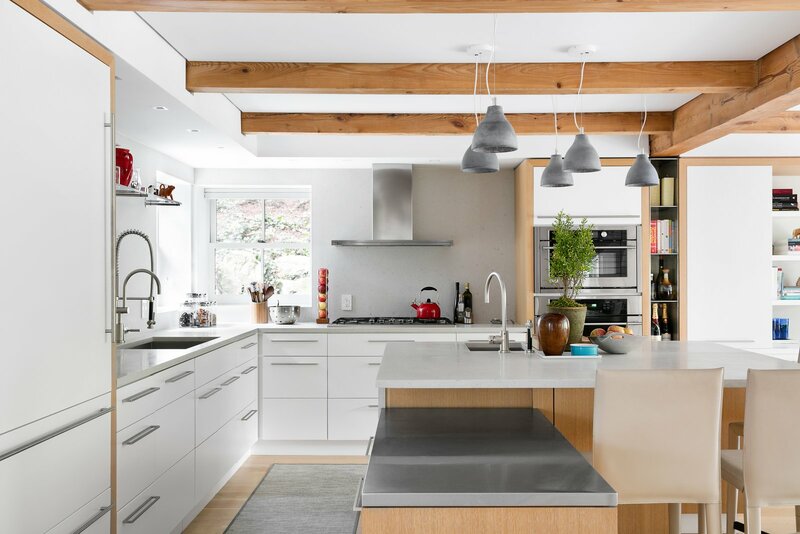 The kitchen’s tubular lights were replaced with Heavy Medium pendants by Benjamin Hubert. 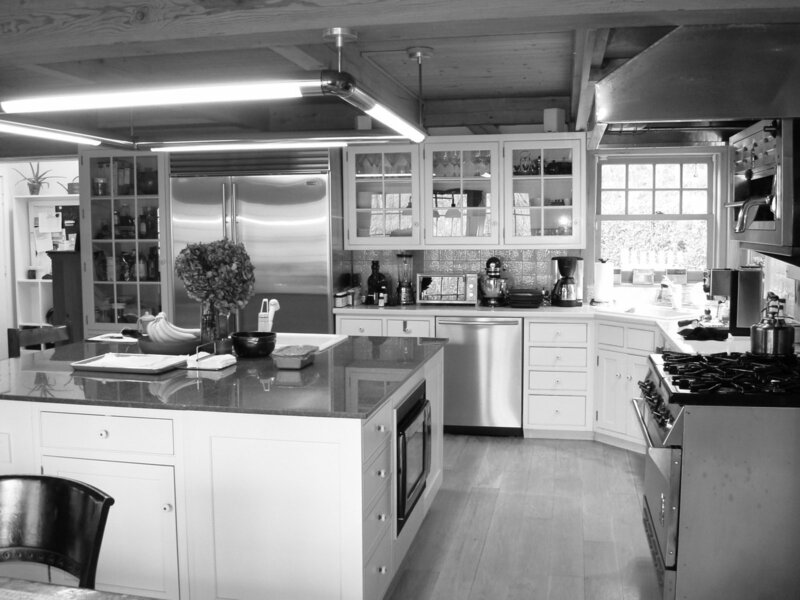 The space is outfitted with a suite of Monogram cooking appliances. At 3,300 square feet, it was also vastly more spacious than what the family was used to. “We were moving out of a tiny 750-square-foot, two-bedroom apartment in the city with two kids,” says Andrew. 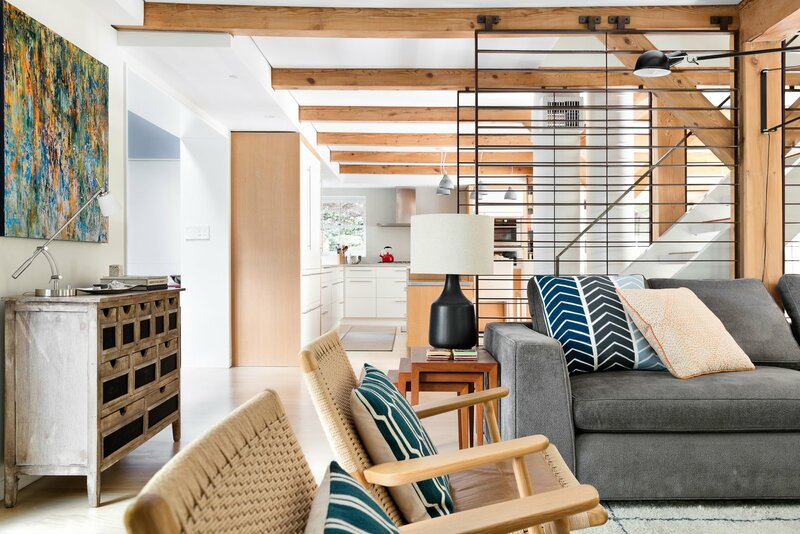 “This house has four floors and is gigantic.” After the couple signed the contract, Workshop/APD designed a down-to-the-framing overhaul and preordered the materials so that the renovation would be ready to go as soon as the sale closed. “Literally, the day we got the keys, we had dumpsters in the driveway,” says Andrew. The house was gutted and rebuilt, inside and out, in just under five months. After gutting a Vermont Frames kit house, resident and designer Andrew Kotchen left its post-and-beam framework exposed. On the main floor , a metal console from a flea market faces a Wisteria stump stool. The Wishbone chairs are by Hans Wegner. 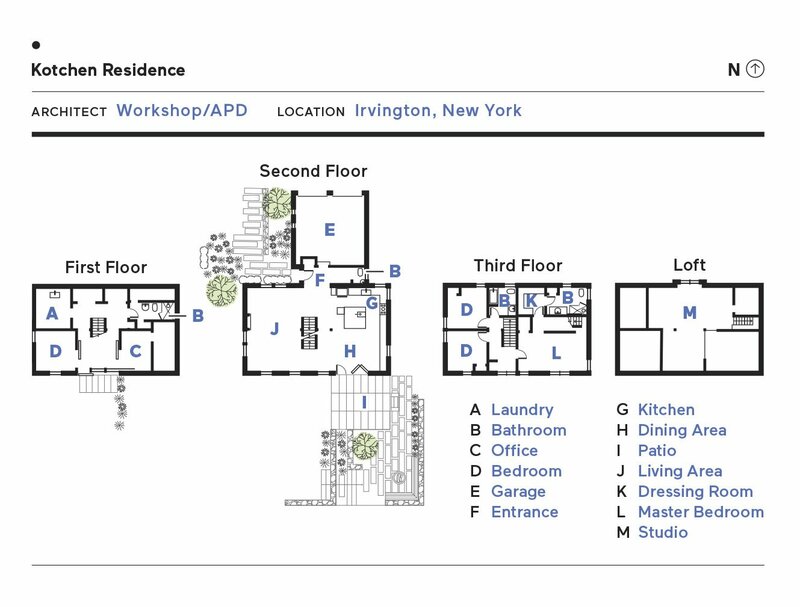 The character of the home is now fundamentally different. The number of windows has doubled, and most of the openings were enlarged to run nearly floor to ceiling. 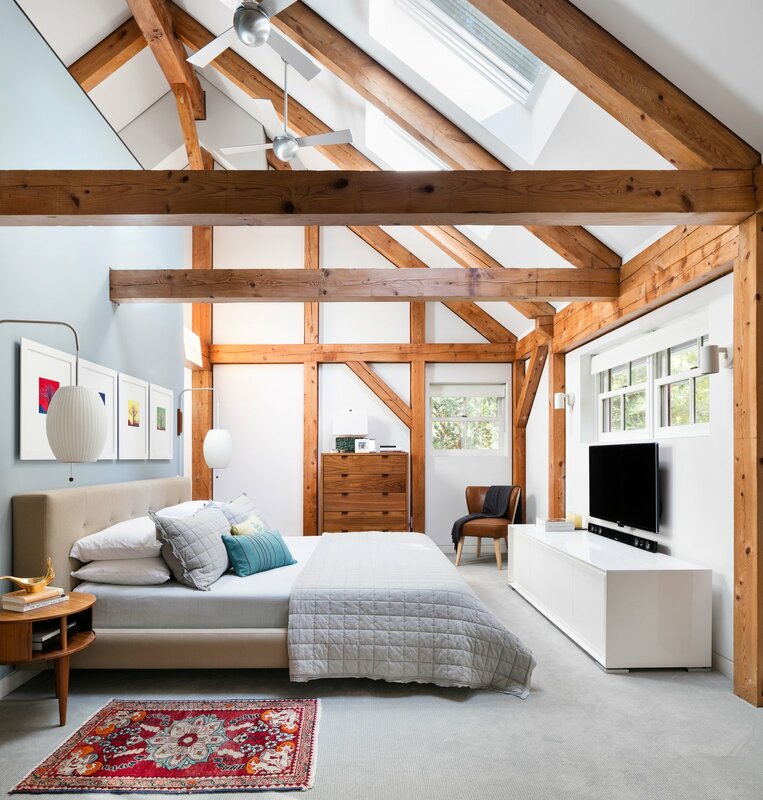 The pine ceilings, which previously lacked any form of soundproofing, were hidden behind drywall that also conceals sound-deadening channels and Homasote. 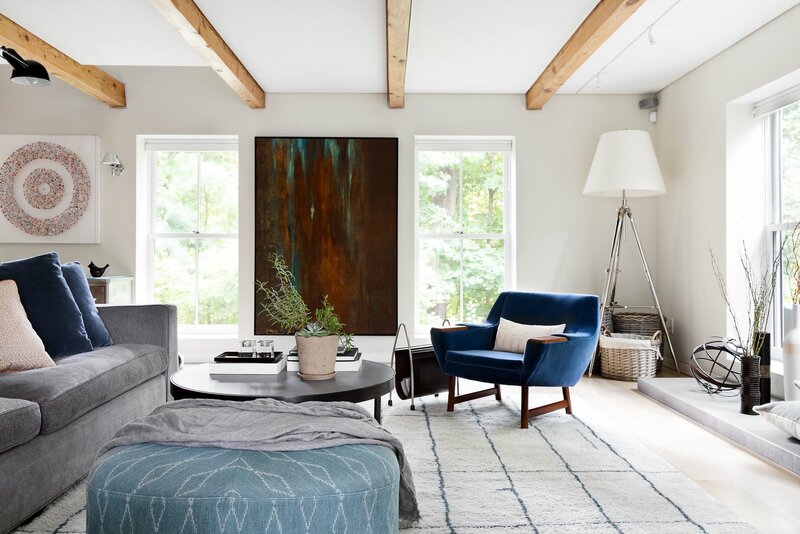 Exposed columns and pine paneling were swallowed up by clean expanses of white walls now punctuated with art, and wood banisters were replaced by screens of weathering steel that double as room dividers. 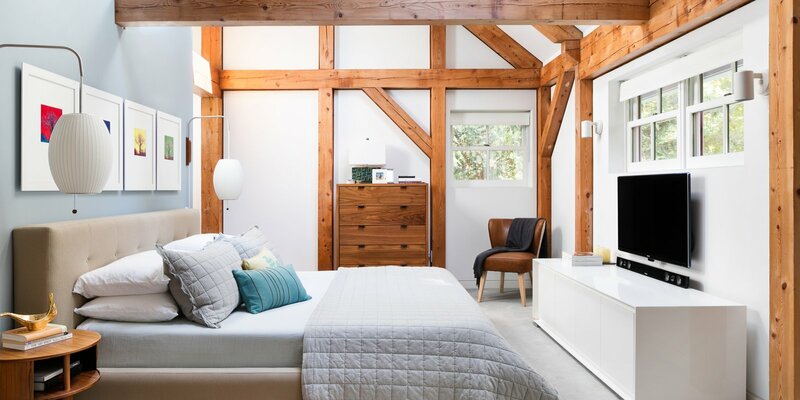 The ceiling beams remain exposed, but within the crisp, new architectural envelope, they take on an industrial feel, delivering on the loft-like atmosphere the Kotchens desired. “It’s a great family home—open, clean, and bright,” says Andrew. 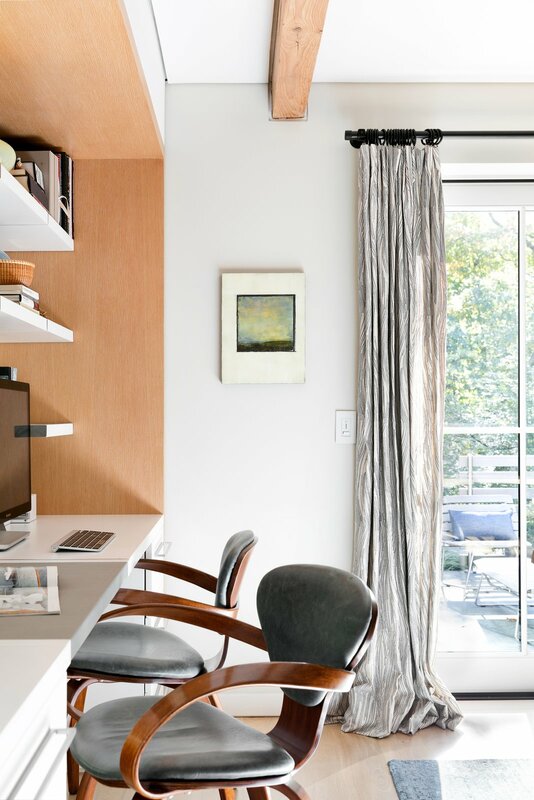 Beside the kitchen, two Cherner armchairs are paired with a built-in desk that extends from the cabinets, made by Corsi. The kitchen, previously busy with chunky appliances and country-style cabinets, is now streamlined, with built-in appliances, Caesarstone countertops, and white-lacquer cabinets that extend to a built-in desk where the kids—William, 10, and Grace, 13—can do homework while the parents cook. 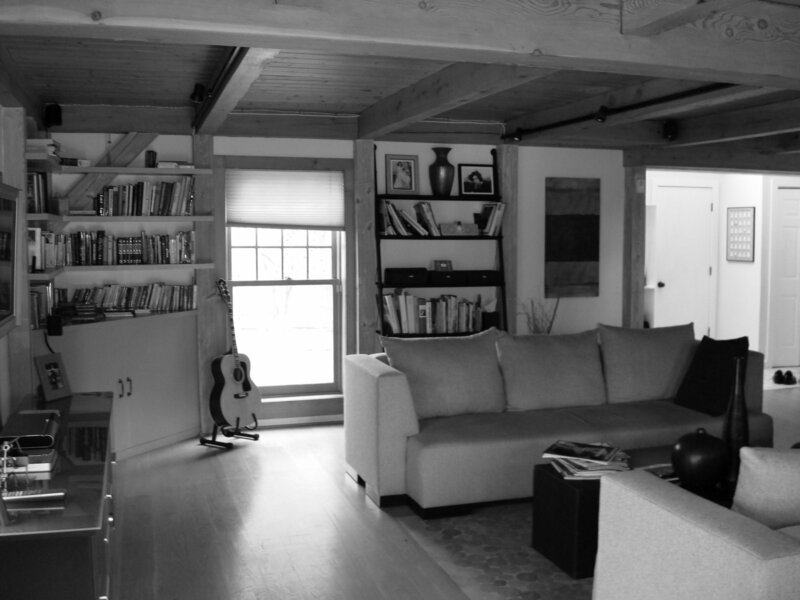 From the master bedroom on the floor above, a steep staircase leads to a storage-loft-turned-studio, where Andrew can draw and Emily, an artist, can paint. The master bathroom, previously a woodsy nook tiled in tumbled marble, is now a sleek composition of seamless Corian, glass, and terrazzo-like flooring that includes pieces of stone and shell. “We’re big beach people, so that just felt right,” says Andrew. The living room furniture includes a Williams-Sonoma floor lamp and a custom ottoman made by Prestige Furniture and upholstered in Romo fabric. The residents doubled the number of windows in the once dimly lit house. Cape Cod Fabrications built the weathered-steel screens that lend form to the staircase.